We invite everyone to join our movement to build this Tribunal by spreading our message and our mission via email and social media, and doing everything you can to educate yourself and your friends and family on the endemic corruption that so urgently demanded a truly independent Tribunal. The blueprint is in place, the foundations have been laid, and it remains for the People of the World to build the ITNJ into the force for change it is designed to be. Please consider making a monthly contribution. We extend our deepest gratitude for your contribution. Every contribution-level helps the ITNJ get off to a strong start on its mission to restore justice for humanity. Thank you for being a part of this movement! Become enshrined as one of the Founding Advocates of this historic initiative, the first planet-wide court for the People, by the People. 5,000 people can change the world. The Founding Advocates listed below have all donated at the $25/month or higher contribution-level, most recent shown first. To become part of this historic movement, click here to support now. Just 5,000 people contributing $25 per month for one year would make it possible for us to put this whole plan in motion. 10,000 people contributing $25 per month would allow us the working capital we need to create a Tribunal that will allow the whole world to experience true justice in a courtroom for the first time in our history. How long will this crowdfunding campaign run? 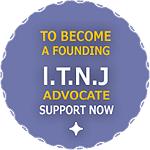 Our first milestone is to launch the ITNJ onto the world stage with the Inaugural Ceremonies of the ITNJ on 14 and 15 June, and then we will continue fundraising for our next milestone to begin hearing cases in Fall 2015. What will happen to funds raised in excess of the $36,000 USD goal? Are there stretch goals? Yes, we have stretch goals! Our first milestone is to fund the Inauguration Event and Ceremonial Seating taking place on 14 and 15 June to launch the ITNJ onto the world stage. Any funds raised in excess of expenses for those events will be directed towards our next milestone of launching the e-Assembly platform and the Case Management System, and hearing our first cases in Fall, 2015. Any funds raised in excess of each consecutive milestone will be directed towards the next milestone. Do you accept PayPal or Bitcoin? What if I don't want to contribute in USD? We are now accepting credit/debit card payments, PayPal, and Bitcoin. Bitcoin donations may be made through Coinbase. In this first phase, most ITNJ donors are based in the USA and our banking is done in the UK, so we are having issues with financial institutions flagging overseas transactions as suspect. If you are in the UK or Europe, you can avoid some of these issues by donating directly on ITNJ.org, where we are set up to accept USD, GBP, or Euros. Do you accept US Postal Money Orders? I no longer engage with banking institutions. If you would like to contribute via US Postal Money Order, please contact Andrea at andrea@ITNJcommittee.org for a mailing address, and we will make sure you receive the appropriate Thank-You Gift for your contribution level. Is this contribution tax-deductible in the USA? Is the Committee to Support the ITNJ registered as a 501(c)3 Non-Profit Corporation? The ITNJ leadership team discussed 501(c)3 status and decided that they could not in good conscience entangle the ITNJ with corporate structures of the US 'government'. While the Committee to Support the ITNJ does not have 501(c)3 status, we are definitely a non-profit organization, and as such, donations up to $250 are tax-deductible with or without a receipt. Please contact us if you would like a receipt in addition to the one that you will receive via email. 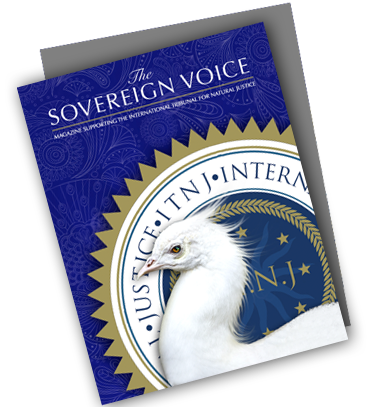 What is The Sovereign Voice magazine? The magazine will track the historic efforts of the International Tribunal for Natural Justice as well as profile the evolution of humanity; from the ‘old earth’ paradigm of corporate dictate and total embezzlement and control of human energy and resource into a ‘New Earth’ of self-governance through the liberation of humanitarian efforts. It will avail itself as an invaluable resource of wisdom and knowledge sharing between all peoples of the world committed to restoring freedom, natural justice and common dignity. What is the New Earth Oracle magazine? The New Earth Oracle is a monthly publication of New Earth Nation and addresses a wide spectrum of subjects of critical importance to living freely and fully "Where humanity stops asking for permission" and takes hold of our sovereign birthright to a healthy and thriving world. What is New Earth Nation TV and when will it be available? New Earth Nation TV will have a channel dedicated to live-stream broadcasts of ITNJ court proceedings. It will also have other channels and most of the programs will be broadcast freely to the People of the World. There will be some premium programming and special events that are pay-per-view, or which you can subscribe to at the contribution-level of $10 per month. What kinds of programs will be available on the premium channels of New Earth Nation TV? What is included in the Flame of Truth Members-Only area of the Natural Justice Academy? Access to members-only areas of the forums. Access to all document templates. Access to one of the most complete archives on Common Law. Access to the archives of Rod Class, including all documents related to his Washington DC Gun Case which he filed or attempted to file with the court and which are not included on PACER, and access to the paperwork filed in his North Carolina cases in which he trapped the judges into admitting on the public record that many of the "public" agencies run by the "government" of North Carolina are actually private for-profit corporations not answerable to the People. What is included in the Exit the Matrix Members-Only area of the Natural Justice Academy? Access to all content included in the Flame of Truth members-only areas, including all forums, all document templates, the most complete archive on Common Law, and the Rod Class document archives. Access to several forums specific to the Exit the Matrix document filing process, in which states will be grouped based on particular document filing requirements that differ from state to state. You will be able to pose questions you were not able to get answered on the conference calls and have them answered by the forum moderators. Access to conference calls designed to lead everyone as a group through the process of filing the status change paperwork. This is no small task, and could take several months to a year. In addition to filing the paperwork, you also have to learn to manage your estate, because up to the time of the status change, you have been a ward of the state, and the state has managed your accounts for you. What is the Proclamation and Letters Patent document offered as a Thank-You gift for Fuel the Fire contributions? This is the historical document that formally established the International Tribunal for Natural Justice on February 14, 2015. Click here to read the full text of the Proclamation. We foresee that years from now, this moment will be marked in history as the turning point when the People rose up and reclaimed their sovereignty. These signed and numbered limited run hand-printed documents will be collector's items commemorating this moment in history and worthy of display in public and private collections. What artwork is featured as a Thank-You Gift for Fire It Up contributions? Team members of the Committee to Support the ITNJ selected this beautiful artwork by Sacha Stone to be printed by a master hand-printer in a limited run, and signed and numbered by the Artist/Founder. This fine art print will be carefully packed into a cardboard mailing tube and delivered to you ready for framing. We love this piece because the lion archetypally represents sovereignty and the wings archetypally represent freedom. The 6-pointed star symbolizes natural laws inherent in the universe, and you can discover this law for yourself by placing seven coins of identical size on a table and pushing them together so that six of the coins make contact all the way around the seventh coin in the center. This is how bees build honeycomb, this is how snowflakes take shape, and this is how rods and cones are arranged on the retinas inside our eyes. I want to attend the Intro to Private Attorney General Training with Rod Class and I need to know when it is scheduled. This class will be held on a Friday, Saturday, and Sunday, and is planned for late September or early October, 2015. I want to attend the Intro to Private Attorney General Training with Rod Class and I need a sponsor. Please send a message to contact@ITNJcommittee.org and we will add you to the waiting list. If I decide to sponsor a specific person for the Intro to PAG Training with Rod Class, how do I notify you of that person's name? You can send us a message at contact@ITNJcommittee.org. If we do not hear from you, we will contact you as we approach the dates to ask whether you are attending, or sponsoring a specific person, or sponsoring the next person on the waiting list. I have a question about the wording of the foundational documents of the ITNJ, including the Proclamation, Mission, Treaty, and Constitution, that I feel some people might not resonate with or agree with. We have received similar messages. The ITNJ has no built-in leanings towards any group, belief system, religion, government, or culture and therefore, cannot speak to what one group vs. another might believe, nor does it assume to know how any living being might interpret its words. The wording on its founding documents has been carefully crafted with the intent that all will know clearly its mission and goal when all material on the ITNJ.org website is taken into consideration as a whole. It is a fact that not all people agree on all things and this is acknowledged and respected by the ITNJ. Is there deceptive 'legalese' in the foundational documents of the ITNJ, including the Proclamation, Mission, Treaty, and Constitution? No. The common sense meanings of the words give the accurate interpretation of the intrinsic meaning of the Treaty mandating establishment of the ITNJ. We are not here to further obfuscate the true nature of law but rather to make it accessible to the people it purports to serve. Am I giving up any of my personal sovereignty by signing the ITNJ Treaty? The ITNJ exists to serve as protector of all sovereign beings, everywhere, and to empower you in exercising personal sovereignty, not take it away. Where are you storing my e-signature? Your e-signature is stored on our secure servers. We have one of the top IT security experts on our team, doing our best to protect your data. After signing the ITNJ Treaty, what is the process for rescinding my ratification should I decide to do so? Simply send us a message conveying your desire to rescind your signature ratifying the ITNJ Treaty and we will honor your request by deleting your name from our list of signatories. What is the symbolism of the ITNJ logo? "The pine cone motif in ITNJ's logo denotes the pineal gland in homo sapiens. It is the organ within the human brain which connects our mechanical intelligence to our meta~intelligence, ie: our capacity to see outside the box, ergo to step outside the proverbial matrix. It is therefore the anchor point of our consciousness to the heavenly realms. “The language of law (legalese) has been, and continues to be, a veiled language, by its very design. The (mis)use of words and meanings equates to spellbinding. The ritualised majick that law has been subverted toward has not served humankind, but has contrarily conspired to delude us from our higher expression. “The ITNJ is breaking these invisible bonds and re-purposing the language of law. It is reclaiming jurisprudence and restoring the foundational axis of Trust and Equity. “The 'figure of eight' symbol on the lateral plane in the ITNJ logo alludes to the cycle of infinity. This denotes an absolutist approach by the ITNJ to pure-truth. Pure-truth is not by degrees, and where it is enshrined will ever serve to anchor the heavens to the causal realm." When was the International Tribunal for Natural Justice established? The International Tribunal for Natural Justice was established on February 14, 2015, in memory of St. Valentine, who died on that day defending the natural rights of the people. When will the ITNJ begin hearing cases? The ITNJ is targeting to hear its first cases in Fall of 2015. What foundations have been laid? A peek behind the scenes at what has already been accomplished. A large team of great minds, brilliant people from many different fields, have spent years visioning what this Tribunal should stand for and how it should function. Sacha Stone founded the ITNJ with much of the vision sourcing from Greg Paul, Director of the New Earth Institute Academy of Law. Dr. John Walsh of Brannagh was brought on board and helped hone the vision. Rebecca Cope came on board as the Founding Director and helped flesh out the vision. Sue Rhoades was named Commission Secretary and the team of volunteers grew. The documents that ground the vision for the Tribunal and will guide its operations have all been drafted and approved, including the Treaty, the Constitution, and the Mission Statement. The first draft of the General Procedure Rules is under review, with meetings scheduled to discuss additions to that document. The website for the Tribunal was built, and the beginnings of The People's Law Library collected. At the insistence of our Chief Justice that the Tribunal remain neutral, the team determined that fundraising activities should run on a separate website, and the Committee to Support the ITNJ was born. The idea for the Natural Justice Academy had been on the drawing board, and suddenly moved onto the servers, with the forums being the first phase developed. On February 14th, the Letters Patent were published officially proclaiming the Tribunal as established and appointing Sir John Walsh of Brannagh as the first Chief Justice. Sir John suggested the anniversary of the signing of the Magna Carta as the date for the first seating of the Tribunal and people were assigned to begin planning that event. People around the world began reaching out to find out how soon they could make application to bring cases before the ITNJ. Sue Rhoades began official duties as Clerk of the Court, taking responsibility for compiling the cases. Sue and the IT team began working to select case management software. What blueprint is in place? What are the next steps for bringing the ITNJ to the world? Chief Justice John Walsh of Brannagh and his Law Officers have drafted General Procedure Rules for operation of the Tribunal. The next step in that area is to develop forms, such as the Application for bringing a case before the Tribunal. Following approval, all of these documents will be published on the ITNJ.org website. We are finalizing plans for the Inaugural Seating of the Tribunal. We are working closely with a leading software developer to have a cae management system in place in time for the first hearings this fall. This will involve purchase of dedicated computer and document scanning equipment, IT support, IT security, training for users of the system, and testing of the system. The founders are working to put the infrastructure in place to begin hearing cases by autumn 2015. This will require office space, space to hold court, more judges, organizing Grand Juries and Petit Juries, administrative support, and everything else required to run a court. We are also planning to have the e-governance system in place by autumn 2015, and this will involve more servers, IT support, more IT security, and testing of the system before the Line In the Sand Conference. The sovereign People of the World are the source of authority. If the People weren't sovereign, they would not be able to authorize a sovereign government, because you cannot delegate authorities you do not have. The People of any nation or country or territory have the right to delegate their authority to representatives they choose to run their government. Case in point: the government of the United States of America is allegedly founded and maintained by the consent of the governed. Where will enforcement come from? Who will enforce decisions of the International Tribunal for Natural Justice? Enforcement is the first question most people ask, and the answer is the People. Just as the People of the World are the authority behind this Tribunal, the People of the World are the authority behind enforcing the decisions of this Tribunal. The signatures of millions on the ITNJ Treaty constitute the authority and jurisdiction for enforcement under International Law. Procedures for implementing a Grand Jury Administrative Hearing include a negotiation phase, which could extend into Truth and Reconciliation hearings. Part of the community enforcement mechanism includes Distrain and Distress by the People. An order to Distrain means to encumber all property and assets available, including real estate, financial assets, jewelry, salaries and paychecks, etc. of “defendants” and spouses. An order to Distress means the community backing the seizure of encumbered assets and holding an auction to convert the assets to funds to pay the “plaintiffs” award, and return the balance to the “defendants”. How does Truth and Reconciliation relate to the mission of the ITNJ? Truth and Reconciliation is a function of the Tribunal that seeks to create a peaceful environment for those who have caused harm to meet with those they have harmed in order to reach a mutual agreement. Just as we envision ITNJ courtrooms operating all over the world, we also envision Truth and Reconciliation hearings all over the world. Over the last several hundreds of years, the violence and force done to People and Planet is so great that it would take thousands of courts running non-stop for decades to prosecute all the atrocities. We want the atrocities to stop, and to that end, we need to focus not on violence and revenge but on remedy and restitution. Truth and reconciliation programs allow those who were swept up into working for corrupt systems to come forward and ask for amnesty. We offer a blueprint for the People of the World to stop the harms being done in their own communities and do what is needed to restore peace and justice. This is the concept of Justice with Mercy. Many who have been accessory to violations of human rights were either deceived or coerced into the actions they took, and thus should not be treated the same way as those who consciously chose to commit harm of their own volition. Why are BAR attorneys involved with the ITNJ? Many people don’t trust them. The ITNJ is and will be independent in the interests of natural justice for all peoples. We have already had discussions regarding representation before the ITNJ as clearly spelled out in the Constitution. To those who say "they do not trust lawyers and judges" I would ask what remedy they would seek. There are only three ways to change things: politically, you need influence and money and lots of it; revolutionary, you need even more money and lots of people united in the one cause who will act together; legally, you need competent lawyers and honest judges, which is what you will get with the ITNJ. Is the ITNJ affiliated with the banking cabal housed in the City of London? The headquarters of the ITNJ is located in London, but well outside of the “City of London”. For those who don’t know, the city commonly known as London has a population of over 8 million people and covers a total area of 1,572 sq km (607 sq m). In contrast, the area known as the “City of London” is a one-mile square territory which is a sovereign city-state, completely separate from London, UK, similar to Washington DC, which is a ten-mile square sovereign city-state completely separate from the USA. Rest assured, no ITNJ offices are geographically located within the one-mile-square territory called the “City of London” and the ITNJ has no affiliation with the corporate fictions that are housed there, nor with the owners or stockholders of those for-profit corporations. Why does your website keep referring to “corporations masquerading as governments”? Most governments have been “captured” and incorporated into or replaced with for-profit corporations. These “captured” governments do not have legitimacy as representational institutions because they are no longer answerable to the people within their territories, but are instead answerable to the stockholders and owners of these private, for-profit corporations. To present these institutions to the people as though they were elected governments is fraud. To continue to hold elections as though the votes of the people had any influence on the operations of these for-profit corporations is fraud. The frauds and crimes committed by the owners and agents of these for-profit corporations posing as governments have reached a critical pitch of destruction. The actions of the agents of these for-profit corporations now constitute crimes against the People of the World, including debt enslavement and war crimes. We expect some of the first cases to be brought before the Tribunal will expose the entire system of “corporations masquerading as governments” on an international level, peeling away the layers of deceit to reveal the names and identities of the actors perpetrating these crimes against humanity. By presenting proof of the trail of corruption in an open forum, the prosecutors will reveal to the People of the World the evidence they require to see the greater scheme of the Source Documents for what it is. Once this scheme is revealed, the People will have the information they need to revoke consent from the deceitful tacit contracts that have bound them. The only power this scheme has is the power it steals through obfuscation. Is the ITNJ trying to implement a one-world judicial system as part of the New World Order, along the lines of the United Nations? Whereas the current system relies on tactics of obfuscation in order to place living men and women under tacit contracts of perpetual servitude (see, for example, today’s 13th Amendment in “the Constitution of the United States”), the ITNJ does no such thing. Supporters of the ITNJ are generally opposed to Agenda 21 and advocate sovereignty for all living men and women. One may at any time remove one’s signature from the Treaty, thus demonstrating that the ITNJ is legitimized by the sovereignty of the people rather than threatened by it. The core team who envisioned the ITNJ is made up of ordinary men and women who are tired of the fraud that controls our lives. We are determined to hold deliberately corrupt agents posing as public officials accountable to the Rule of Law. Im curious as to why you have used the Pine Cone as a symbol for the ITNJ logo? Considering the Catholic Church also use this ‘pine cone’ symbol in many areas and its relation to the pineal gland, im interested as to the process that brought you to the inclusion of this symbol for ITNJ. “The pine cone motif in ITNJ’s logo denotes the pineal gland in homo sapiens. It is the organ within the human brain which connects our mechanical intelligence to our meta~intelligence, ie: our capacity to see outside the box, ergo to step outside the proverbial matrix. It is therefore the anchor point of our consciousness to the heavenly realms. all a very nice idea…..can not see who is behind all this though? quite possibly a scam….if it isn’t there is also the question of how do you enforce any judgement without a standing army? First I would like to sincerely apologize, on behalf of the Committee to Support the ITNJ, for the very late date of this reply! We have had growing pains and hiccups along the way as we have been working 24/7 to materialize the Vision and Noble Endeavor that was thought of and crystallized by Everyone who has been talking, researching, taking actions, building community in Unity, and sharing Truth, Freedom and Justice, Globally for many centuries! We are looking for many more volunteers here at the ITNJ, to make this the badly needed success that our World is standing up for! We have begun the work that every awakened conscious being is invited to accept at this time in our history! “quite possibly a scam” That is for you to decide for yourself, as it is for each of us. Please review all the links throughout both the http://www.itnj.org and http://itnjcommittee.org websites and continue to question and discuss, to satisfy yourself! Please be advised that we are still growing everyday and we invite you to inform us of any mistakes or concerns you have. featuring an exclusive interview with a retired FBI Senior Investigator and guests Santos Bonacci, Steve Stars, Justin Deschamps, Dr. Chris Cleverly, and Dr. Christina Winsey, hosted by Sacha Stone and Rebecca Cope, May 4, 2015. I hope I have answered you questions satisfactorily at this time. it gives the impression that if you don’t have 20 bucks to give you are indeed “too small to make a difference”. Could you please elaborate so I can review, as we are still growing everyday, we invite you to continue to inform us of any mistakes or concerns you may have. Together we can change the impression it gives of “it gives the impression that if you don’t have 20 bucks to give you are indeed “too small to make a difference”.”, this is definitely not the impression that is intended at all! In fact we would like everyone to give what ever they can and are Willing to give from the micro to the macro, every bit and piece (peace) helps! We are very grateful to everyone for their energy exchange to Support the ITNJ, no matter what that exchange is, whether they can donate financially or not! other organizations (such as http://www.nationallibertyalliance.org/). the second link is: ITNJ working with alaska judge and or Cindy K.
Courrier? That is 3 questions total here. Committee to Support the ITNJ, for the very late date of this reply! CONSENT TO THEM CAUSING HARM ON EARTH! Thank you for creating this platform and all your energy you have contributed into this most esential cause. I support you with all my heart and wish I will be able to contribute to this cause in greater extend soon. I am so touched by your stand you have not only for yourself but for the whole planet. I love you, I support you, I thank you. I’d like to donate 25 not monthly as I don’t know about next month or what it will bring…… where do I go for that? Dear Shirley, Thank you for your interest and your heartfelt communications, which we hope we took care of appropriately. To Donate any amount you wish, please do so at https://www.itnj.org/get-involved/contribute/ Much appreciation! I’ve tried to sign up for Flame of Truth ($25 monthly) and ran my card 4 times with no results. I’m hoping my card doesn’t get charged 4 times. Am I doing something wrong? Hi Cindy. Sorry about that! And thank you for making us aware of this. I’ll find out what’s going on and get back with you.. Thank U with all my heart! I AM with all the world, we are the One People! Huge heartfelt thanks to everyone who participates in this vital – in every sense of the word ! – initiative of, by, and for THE ONE PEOPLE of this planet, our Mother Earth. In the name of solidarity, peace, and especially of all our children. Heartfelt thanks for your heartfelt support! The International Tribunal for Natural Justice now stands as sentinel and protectorate for all, and we invite you to stand with the ITNJ. The ITNJ is relying on the People in and of the World to fund the inaugural proceedings, launch, and ongoing operations of the Tribunal. Please consider making a monthly contribution. Then join our movement and share this campaign far and wide. *** Featured *** Continuing contributions at this level will be rewarded with continuing access to members-only areas of the Natural Justice Academy website. Plus all Thank-You gifts in Kindle the Flame, plus your name listed on the ITNJ website, enshrined for all time as a Founding Advocate. Front row seating for all live broadcast transmissions of ITNJ Tribunal proceedings and all regular programming on New Earth Nation TV, plus monthly subscriptions to The Sovereign Voice and New Earth Oracle magazines, plus your name listed on the ITNJ website, enshrined for all time as a Founding Donor. Front-row seating for all premium and regular broadcasts on New Earth Nation TV, plus all Thank-You gifts included in Spark the Change, plus your name listed on the ITNJ website, enshrined for all time as a Founding Donor. Four-month subscription to all Thank-You gifts included in Spark the Change, plus your name listed on the ITNJ website, enshrined for all time as a Founding Donor. Your very own commemorative print of the Proclamation / Letters Patent, the historical document establishing the ITNJ, beautifully hand-printed, signed, and numbered by a master hand-printer, ready for framing. Plus a one-year subscription to all Thank-You gifts in Spark the Change, and your name listed on the ITNJ website, enshrined for all time as a Founding Advocate. ***Special*** for those seeking status as Private American Nationals. Access to all document templates plus access to conference calls and the Exit the Matrix members-only area of the Natural Justice Academy website to support you through the process of filing the paperwork required to declare your status as a civilian under the protection of the Geneva Conventions and the Universal Declaration of Human Rights. Plus one-year subscriptions to all Thank-You gifts included in Kindle the Flame, and your name listed on the ITNJ website, enshrined for all time as a Founding Advocate. Beautiful print of an artwork by Sacha Stone, selected by team members of this Committee, printed by a master hand-printer in a limited run, signed and numbered by the Artist/Founder, ready for framing. Also includes one-year subscriptions to all Thank-You gifts included in Kindle the Flame, and your name listed on the ITNJ website, enshrined for all time as a Founding Advocate. Attend Intro to Private Attorney General Training with Rod Class in Fall 2015, or sponsor someone to attend. Plus one-year subscriptions to all Thank-You gifts included in Kindle the Flame, and your name listed on the ITNJ website, enshrined for all time as a Founding Advocate. Attendance for two for the Intro to Private Attorney General Training with Rod Class in Fall 2015, or sponsor two people to attend. Plus receive the beautiful signed and numbered artwork print by Sacha Stone offered in Fire It Up, plus receive the commemorative print of the ITNJ Proclamation offered in Fuel the Fire, both ready for framing. Plus one-year subscriptions to all Thank-You gifts included in Kindle the Flame, and your name listed on the ITNJ website, enshrined for all time as a Founding Advocate. Attendance for two for all three days of the Line In the Sand conference to be held in October, 2015 at a USA location to be determined. Accommodations and meals included. Plus one-year subscriptions to all Thank-You gifts in Kindle the Flame, and your name listed on the ITNJ website, enshrined for all time as a Founding Advocate.